Life/form® molding and modeling techniques give KERi™ a realistic appearance as a woman, or as a man when the wig is removed. The unique visual features reinforce the importance of inspecting patients and noting changes in their appearance. All joints provide lifelike range of motion not found in other manikins. Life/form® simulations have been included to allow the practice of more than 35 patient care procedures. Perfect for all OBRA required training. Full five-year warranty. 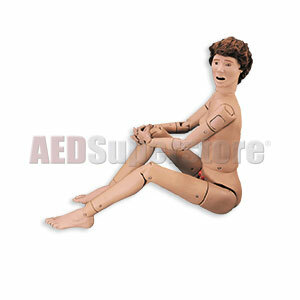 Manikin meausres approximately 58", weighs approximately 28 lbs.